Why use table skirts for your next event? 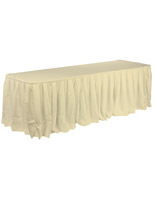 These polyester fabric tablecloth edgings will benefit your service related business whether you are a private caterer that is hired to do weddings or a hotel manager that hosts banquets. The wholesale table skirts are able to make any trade show or convention display table look more appealing to potential customers that walk in or by your booth. The box pleat side covers are also able to hide party supplies or exhibition tools that are stored underneath so that guests or clients don’t seen them, but the necessities are still close at hand. The folding table skirts, called tablecloth edgings, are sold without throws or toppers in order to accommodate existing linens that businesses may already own. 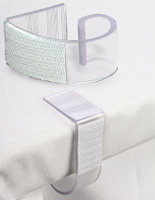 There are also plastic skirting clips that are available here that use Velcro® for a strong attachment to our box pleat polyester covers and have ribbed tops to stay in place on fabric. The professional-looking tablecloth edgings are sold in black, white and ivory with other colors, like royal blue, hunter green, and burgundy, available as well. The event and trade show borders are designed to fit round and rectangular dining surfaces for versatility with existing furniture. 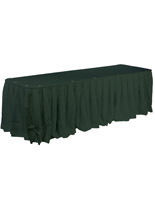 What tabletop sizes are able to be used in conjunction with the tablecloth edgings? 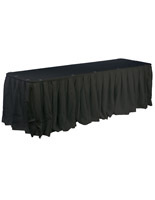 These folding table skirts are able to fit several sizes of dining furniture depending on the length purchased. These edges sold in 13.5’ lengths are able to surround rounds that are 48” in diameter or three sides of 6’ or 8’ tabletops. The banquet cloths that measure 17.5’ in length are very versatile table skirtings indeed. These trade show display borders will fit completely around 60” or 66” diameter rounds, four sides of a 6’ tabletop, or 3 sides of an 8’ or two side-by-side 6’ rectangles. Lastly, the table skirtings that are 21.5’ long, which are the largest length we sell, are able to fit 72” circular tabletops, four sides of an 8’ rectangle, or three sides or two 8’ dining surfaces butted against one another. As with the smaller sizes of fabric cloths, these borders are able to be used with smaller party supplies, but will need plastic skirting clips to hold them in place. 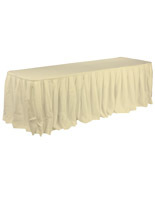 Affordable Polyester fabric is a great choice when it comes to purchasing tabletop linen side covers for banquets, weddings, or trade shows. The cloths are durable because of the materials of which they are made and will hold up well use after use. Polyester is a wrinkle-free fabric so even after the event & party supplies are stored, they are ready for use on tabletops with minimal hassle. 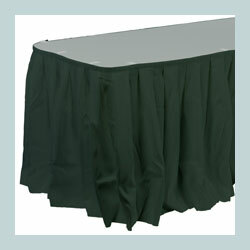 The care of the box pleat linens for counter sides is easy because they are machine washable. No more panicking when guests or customers drop food, coffee, or wine on the covers! To erase more worries, this fabric is flame-retardant so it is ideal for large gatherings of people and will satisfy those trade show or event venues that only want fire-safe linens used. Additionally, polyester is cheaper than other fabrics often chosen for fancy banquet surfaces and with all of the above benefits why pay more for a material that has poorer performance!